높이가 낮고 뿔이 넓으며 둥근 오사모(烏紗帽)에 단령(團領)의 정장관복본을 입고 공수(拱手) 자세를 취한 채 의자에 앉아 있는 전신교의좌상(全身交椅坐像)이다. 좌안칠분면(左顔七分面)의 취각(取角), 화려한 채색의 채전(彩氈)의 문양과 기법, 족좌대(足座臺) 위에 놓인 혜(鞋) 등이 모두 조선조 중기 공신상의 한 전형을 보여주고 있다. 초상화의 인물은 학정금대(鶴頂金帶)를 두르고 해태문양의 흉배를 하여 초상화 인물의 품계가 종2품임을 나타내주고 있으며, 1624년 진무공신(振武功臣) 책록을 받은 직후 그려진 것이 아니라, 황해도 병마 절도사로 있었던 1630년대에 그려진 것임을 알 수 있게 해 준다. 이 상은 공수자세를 취한 양손 사이로 흰 창의(氅衣) 소매가 보이는 점에서 선무(宣武), 호종(扈從), 정난(靖難) 공신상 등과 같은 고식을 보여주며, 단령의 트임 사이로 내비치는 안감 및 첩리의 형식상 나란한 배열은 17세기 초 중기공신상의 변모해 가는 형식적 특징을 보여주고 있다. 안면기법은 살색을 기조로 하여 안모의 외곽 및 이목구비 부분을 약간 짙은 갈색의 선묘 위주로 처리하고 음영법을 거의 사용하지 않았으며, 단지 법령(法令) 및 협(頰)의 부분이나 이문(耳紋) 부위에만 음영이 약간 깃들어 있다. 옷주름 처리도 굵고 검은 선으로 대표적인 주름선만을 그었고, 굴곡진 주름 부분엔 질감 묘출을 위한 선염기(渲染氣)가 들어가 있지 않아 역시 고식(古式)을 띠고 있다. In this portrait, the subject is seated on a chair wearing an official robe and hat, with the hands clasped within the sleeves. The portrait is typical of an image of a government official in the mid-Joseon Period (1392-1910) in terms of the face turned slightly to the right, beautifully colored carpet, shoes, and footrest. The gold-edged belt and piece of embroidered cloth attached to the front and back displaying the image of haetae (mythical unicorn-lion) tells us that the subject is a Grade 2 official. 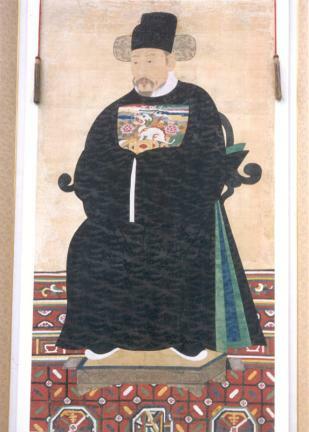 Thus, the portrait was made in the 1630s when he was a military commander in Hwanghae-do, not right after he was designated as a meritorious subject in 1624 for his feat of crushing the rebels led by Yi Gwal. The white cuff and the hands clasped within the sleeves show that the portrait follows an olden-day style as with the images of meritorious subjects designated as such for their role in defending the country during the Japanese invasion in the late 16th Century, escorting the King or his family, or getting the country out of danger in a crisis situation. The lining material shown between the lapel gap and the neat patterns of the robe indicate the changing features in the style of the images of meritorious subjects in the early 17th Century. As for the face of the subject, the contour of the face was made chiefly in slightly brown lines based on light-orange color. Shading techniques were hardly used. The curved line between each cheekbone and the nose flowing down to the side of the mouth, the cheeks, and the ear show slight shading. As for the wrinkles of the robe, only the major wrinkles were portrayed in thick, black lines. No techniques for portraying the texture in curved wrinkles were used, showing that the portrait follows an olden-day style.